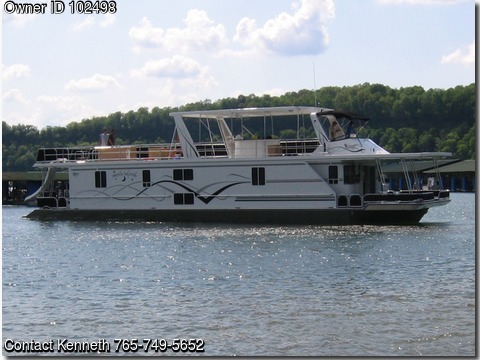 Boat is located in Albany,KY.Please contact the owner @ 765-749-5652...Twin engine, Bow Thruster, 12KVP Generator, 3 ton HVAC,2 100 gal fuel tanks, 100 gal freshwater tank, lake water system for shower and full size washer also full size dryer.2 bathroom with Hollywood style shower, 160 gal black water holding tank for each bathroom, presently 1 queen guest berth, king master suite with potential for 2 additional cuddy berths1 presently has built in office, second unfurnished, full kitchen with refrigerator, trash compactor, dishwasher, electric rangeall full size salon has electric fireplace. Upper flybridge with full controls, 24 ft hard party top with bar equipped with sink refrigerator and ice maker upper deck also has slide. Swim platform equipped with 2 jet ski storage ramps each with electric winch. Inverter system is equipped with 10 batteries. 12x16 front deck, 9x16 rear deck many other extras.